Concord Youth Theatre’s PLAYTIME THEATER is moving to the Harvey Wheeler Community Center in West Concord – 1276 Main Street, West Concord. Parking is in the back of the building. You can enter the parking lot on Church Street. All shows at 10:30am. $5/person, cash or check only – no advance sales. Suggested audience ages 2-9. 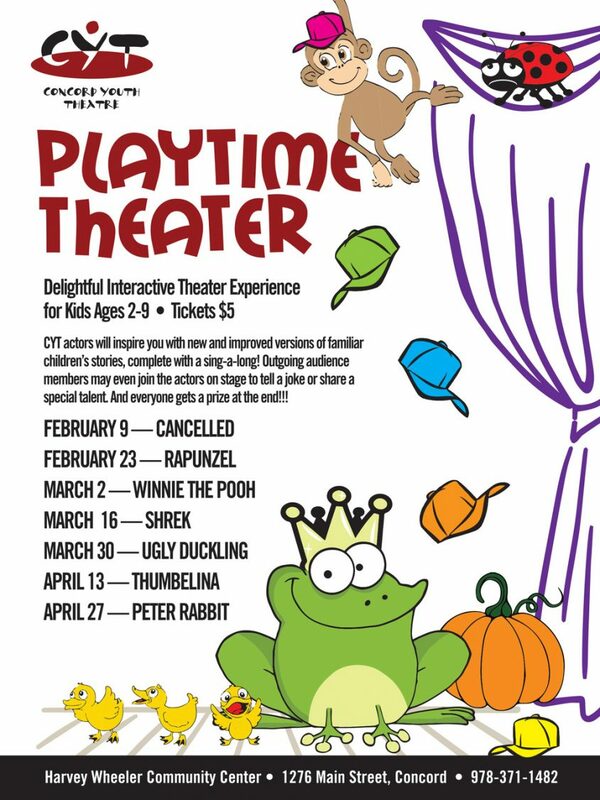 Come spend Saturday morning with CYT’s Playtime Theatre – a delightfully interactive theater experience! CYT actors will inspire you with new and improved versions of familiar children’s stories, complete with a sing-a-long! Outgoing audience members may even join the actors on stage to tell a joke or share a special talent. And everyone gets a prize at the end!!! So, put on your performing hats and come play with us!! !